Among the 9.4 million episodes of foodborne illnesses identified in the United States, salmonellosis (foodborne gastroenteritis) accounts for 1.2 million cases, with approximately 23,000 hospitalizations and 500 deaths, and a cost of $3.6 billion annually (CDC report, 2016). Most salmonellosis cases occur due to the consumption of animal products contaminated by non-typhoid Salmonella (Salmonella enterica subsp. enterica); however, a broad diversity of other fruits and vegetables (cucumber, sprout, mango, etc.) were identified as the cause of salmonellosis outbreaks worldwide over the past decades . More than a dozen wide-scale Salmonella outbreaks related to tomato fruits have been reported since 2001 in the United States . In many instances, the sources of these outbreaks remain unknown. Further, due to the asymptomatic nature of the interaction between Salmonella and tomato plants and fruits, and the limited anti-salmonella efficacy of commonly available sanitizers, the detection and control of Salmonella in fresh produce remain challenging. Salmonella is a foodborne pathogen responsible for gastroenteritis in humans due to the consumption of contaminated food. It is the third most common agent associated with foodborne illnesses, and the No. 1 foodborne pathogen causing most hospitalizations and deaths in the United States (CDC report, 2016). Salmonella is a rod-shaped enteric bacterium composed of more than 2,500 serotypes capable of colonizing the gut of a hundred different hosts. S. Enteritidis and S. enterica ser. Typhimurium are the most commonly encountered serotypes in human outbreaks. In humans, symptoms (stomachache, fever, diarrhea, and dehydration) occur after 6 to 48 hours following ingestion of contaminated foods, and can last up to seven days. Salmonella does not induce symptoms on contaminated tomato plants and fruits (Figure 1 A & B) even if the Salmonella population in tissues can reach up to 107 CFU per fruit (Figure 1C). Figure 1. Pictures of asymptomatic tomato plant tissues contaminated with Salmonella. The pictures were taken seven days after inoculation of the plant with water containing 108 CFU.ml-1. (A) Contaminated tomato plant. (B) Contaminated ripened tomato fruits. 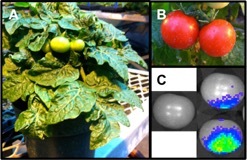 (C) Real time in vivo imaging of ripened tomato fruits contaminated with Salmonella. Tomato on the left: Salmonella-free tomato; Tomatoes on the right: Salmonella contaminated tomato. The abundance of Salmonella in fruits is proportional to the bioluminescence signal detected. Purple/blue: low intensity signal; Green/yellow: medium intensity signal; Red: high intensity signal. The bioluminescence signal was measured at 570 nm for 30 seconds using an IVIS Lumina series III imaging system. Approximately 106-107 Salmonella bacteria per fruit were recovered after plating on XLT4 agar plate. Salmonella is ubiquitous in the environment and can survive for months in detrimental conditions. Urban areas, animal installations, and surface water sources are areas with higher probability to detect Salmonella. Therefore, production systems at proximity to these areas have a higher risk to be contaminated by Salmonella. This risk can be even greater in period of extreme weather conditions (heavy rainfall, flooding and storms), by increasing the dissemination of Salmonella from contaminated areas . Contaminated hosts (workers, livestock, wild animals, and insects) represent a risk for the transmission of Salmonella to the crop. For example, contaminated workers and animals can introduce and/or spread Salmonella within and between fields by direct contact with the plant tissues or defecation [1,3]; Insects (Musca domestica, Frankliniella occidentalis, and Macrosteles quadrilimates) can transmit Salmonella during the feeding process or defecation on the plants . Salmonella can also be transmitted via the use of contaminated materials and products (untreated seedling, water, dust, soil, and agricultural inputs) . Contamination of the crop can occur at all stages, from pre-seedling to post-harvest . Once in close contact with the plant tissues, Salmonella can survive on the surface of the plant for several weeks in the phyllosphere and up to months in the rhizosphere depending on the environmental conditions, diversity of the plant associated organism, management practices, and nutriments available. Type I trichomes have been also identified as a site of predilection for Salmonella persistence . The internalization of Salmonella in plant tissues can occur in leaves, roots, flowers, and fruits using natural openings (stomata, hydathodes, lenticels) and wounds . If Salmonella is internalized in the leaves, it will persists in the apoplast for several weeks until it reaches the phloem vessels where it might start its dissemination throughout the whole plant; however, this phenomenon is rare and not completely understood yet [3,5]. Throughout these steps, S. Typhimurium populations remain low in photosynthetic tissues while it can be detected at high density in ripened fruits, suggesting that Salmonella could utilize specific type of sugars only stored inside the fruit . Salmonella persistence in plants is affected by the tomato variety used (genotype, maturity, physiological status, and plant exudates), the quality of the bacterial inoculum (genotype, abundance and physiological status of Salmonella), the route of transmission, and other parameters surrounding Salmonella (environmental conditions, nutrient availability, and the phytobiome diversity) [3,6,7]. Temperature, light, and relative humidity affect the production of biofilms by Salmonella and consequently its survival abilities on the plants [3,8]. Further, the presence of certain plant associated organisms affect the persistence of Salmonella in tomato tissues . Plant pathogens such as Xanthomonas species (causal agent of the bacterial spot on tomato), Clavibacter michiganensis subsp michiganensis (causal agent of bacterial wilt on tomato), Erwinia herbicola, and Pseudomonas syringae (causal agent of bacterial speck on tomato) tend to enhance Salmonella persistence in tomato tissues; while beneficial plant organisms such as Bacillus reduce it . Several types of tests are available to detect Salmonella. The test can be based on the amplification of a specific nucleic acid sequence, the recognition of a specific protein, or the biochemical characteristics of the pathogen. Traditional culture on API20E test strips is a low-cost method requiring minimal lab facilities. In healthcare applications, the tests allow for identification of the pure Salmonella strain tested based on biochemical characteristics. However, this method takes minimum two days before confirmation of the results and requires a pure culture of the bacterial strain. Both Lateral Flow Assays (LFA) and Enzyme Linked ImmunoSorbent Assays (ELISA) are sensitive, specific, fast, and low-cost methods to detect Salmonella. ELISA is a method used in a laboratory because it needs specific tools and knowledge, while LFA is the only one applicable in the field and does not require specialized training. However, ELISA is a more sensitive technique than LFA. These tests identify the presence of the pathogen based on the interaction of Salmonella proteins (antigens) and antibodies developed against them. For example, DuPontTM created a lateral flow system able to detect Salmonella from environmental samples. Polymerase chain reaction (PCR) amplification is a fast, very specific, and sensitive method, although it requires specialized and expensive facilities. Targets can be a universal gene such as the 16S ribosomal RNA sequence, or specific genes such as fimA, invA, and fliC. For the 16S rRNA sequence, skills in bioinformatics are necessary. This technique is very specific and has the highest detection level among the four methods; however, it needs expensive molecular tools and an extensive knowledge of the pathogens and bioinformatics. Loop-mediated isothermal amplification is another PCR method allowing a fast detection of Salmonella in the field, without specific tools other than a water bath set between 60 to 65 degrees Celsius. This technique is very sensitive, however, the level of detection varies depending on sample source . Selecting a site for crop production is the first step in avoiding Salmonella. It is beneficial to select an area with minimal extreme weather. This area also should be far from potential sources of inocula (other crop productions, animal farms, holding facilities, rivers or streams downstream of large municipalities). Other precautions should be considered depending on the type of production used. A. The detection of Salmonella prior to seedling is essential. Samples of soil, water, and animal defecations, as well as potential plant host and insects around the concerned area can be analyzed via one of the techniques described above to confirm absence of the pathogen. B. Planting materials and inputs should be pathogen-free in order to prevent the introduction of Salmonella; for example, treatment of tomato seeds with chlorine bleach . As soon as items are received, they must be stored in a dry and cold room or used with sanitary precautions. C. Water is the main source of contamination. It must be originated from safe sources and workers should constantly be in contact with water system administration to be aware of potential water contamination. Surface water problems should be fixed as soon as possible via a mechanical aeration of the soil to prevent the formation of water puddles favorable to Salmonella survival. D. Control of vector populations (insects, wild animals, and workers) is very important in protecting tomato plants from Salmonella. Animal and bird intrusion can be controlled by the installation of barriers and nets around and on the structures. Insect populations may be monitored using sticky cards and controlled by application of insecticides and biocontrol agents on the whole plant. Based on the Midwest vegetable production guideline, the following insecticides are allowed in open field against aster leafhopper: Actara®, Asana®, Baythroid®, and Platinuium®. The following can be used against flower thrips: Ambush 25W®, Assail 30SG®, Baythroid®, Brigade 2EC®, Mustang MAX®, Warrior II®, and Radiant SG®, . Normal flytraps with pheromones may be used and permethrin as insecticide . Employees in contact with tomato plants should wear boots, gloves, and hats, and use hand sanitizer before and after manipulation of the crop. Finally, any object in contact with the crop must be sterilized with a disinfectant solution before and after operations. E. Vegetal residues and alternative host must be removed all year long. A. Like for an open field, site selection is important to prevent infected tomatoes by Salmonella. Same level of caution is recommended, and growers should control everything coming into the structure and establish a complete hazard analysis and critical control point plan. C. Water is also a main concern for greenhouse production. It must be originated from safe sources and be filtered before use. To avoid post-filtration contamination, plants should be watered with a sub-irrigation system. Surface water problems should be fixed as soon as possible using an evacuation water system. D. In a closed environment, insects and workers are bigger problems for Salmonella transmission. Therefore, control methods need to be used more frequently. Insect populations must be monitored daily using sticky cards and controlled weekly by applications of insecticides and biocontrol agents on the underside of the leaves (predilection sites of insects). Based on the Midwest vegetable production guideline, the following insecticides are allowed in greenhouses for aster leafhopper: Admire PRO®, Asana®, Baythroid®, Lamata SP, and Sevin®. For flower thrips: Admire PRO®, Ambush 25W®, Assail 30SG®, Baythroid®, Brigade 2EC®, Entrust®, Exirel®, Mustang MAX®, and Warrior II®, or Neoseiulus cucumeris can be used as a biocontrol agent . For the Musca domestica, normal flytraps with pheromones may be used, as well as Muscidifurax raptor wasp as biocontrol . In a closed environment, workers must protect their skin and wear respiratory systems to avoid possible side effects due to the pesticide. To prevent the transmission of Salmonella, employees in contact with tomato plants must, at a minimum, wear boots, gloves, and hats, and use hand sanitizer before and after manipulation with the crop. Finally, any object in contact with the host must be sterilized with a disinfectant solution before and after operations or manipulations of the tomato plants. E. Vegetal residues and alternative host must be removed daily. No effective treatment exists to protect or to cure tomato tissues contaminated with Salmonella. However, keeping plants healthy and free of diseases, decreases the impact of Salmonella on the crop. Growers must follow good agricultural practices. Employees must receive proper trainings to avoid transmission of Salmonella to the crop or the other way around; adequate sanitation structures should be available during working hours; tools and engines must be decontaminated after utilization. Sapers GM, Solomon E, Matthews KR. The Produce Contamination Problem: Causes and Solutions. Academic Press; 2009. D. Nammour JP. Integrated Pest Management in Rose Greenhouses Using Franklinothrips vespiformis against Thrips. 2008; 291–296.